Every year Reynolds Theatre performs a musical for parents and the surrounding community. 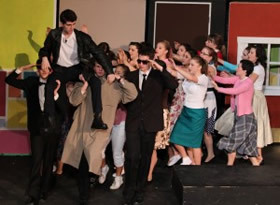 Past performances include Music Man, Grease, Guys and Dolls and in 2012 featured Bye Bye Birdie. Students from all areas and levels of experience join together through musical theatre. On stage and off, the Reynolds Theatre students always come together and put on a great show. Interested in joining the cast or crew? Auditions are held in the fall and the performance usually runs for at least a week in late February, early March.